Cowboys & Aliens is Exactly What It Says on the Tin – Nothing More; Nothing Less! Movies don’t get more high concept than Cowboys & Aliens. Like Snakes on a Plane, Jon Favreau’s new film delivers precisely what it promises. Therein lies the problem. The first twenty minutes or so of Cowboys & Aliens could be mistaken for a remake of Sergio Leone’s Man With No Name movies filtered through the cinematography of John Ford’s classic westerns – except for the high-tech bracelet on our laconic hero’s left wrist. Daniel Craig’s flinty blue eyes may look puzzled as he finds himself in possession of the odd jewelry, but they turn deadly when three would-be bounty hunters try to take him. Without weapons, and with a minimum of fuss, he relieves them of consciousness and outfits himself in the best of their duds [which are, while not great, still better than what he starts with]. He also realizes that he’s been wounded somehow. In short order, he hits the local saloon – after knocking out a blowhard rich kid [Paul Dano] with a knee to the groin [after the kid wounds a deputy] – and learns, via the sheriff [Keith Carradine] that he’s Jake Lonergan, a wanted man. As the kid and Jake are about to be taken off to face a regional magistrate, the kid’s dad, Colonel Dollarhyde [Harrison Ford] arrives demanding both be released to him. Then all hell breaks loose as the film moves from a very traditional – and not particularly inspired – western and into the realm of high concept mash-up as the aliens begin plucking up random townspeople with long, metallic tentacles. One of them takes Dollarhyde’s son, Percy. And yes, there’s a gorgeous, fiery, independent woman [Olivia Wilde] who knows more about Jake than she’s saying. Cowboys & Aliens is an odd duck. It’s beautifully shot, moves well and the cast seems to be having fun. The cinematography, by Matthew Libatque, is frequently breathtaking. The problem is that if there weren’t some surprisingly receptive Apaches, this would be a very standard, old school cowboys & Indians movie with nothing much to distinguish it besides that cinematography. There are lots of characters – but few we can actually identify with; nasty aliens – effectively repulsive but vaguely familiar, and most of the cast looks too modern to be believable in the setting. There are moments when you can see what the movie could have been – the way the alien vessel is camouflaged; that first eerie attack that comes out of the night; the scene where we learn why the aliens are there. Unfortunately, there are few other moments of genuine imagination. Even the entirely appropriate use of Olivia Wilde’s unearthly beauty is rendered ineffective – whether because of her performance choices or direction doesn’t really matter. Even harder to swallow is the evolution of Dollarhyde from the merciless man who holds the town in terror to a caring surrogate father. Ford is good, but he’s not that good. Given that Cowboys & Aliens had been awaiting production for better than a decade before it finally got greenlighted – and that many more writers than those credited [half a dozen names between story and screenplay] – it’s probably amazing that the film doesn’t stink on ice. Still, pretty average is not much payoff for the movie’s huge budget and terrific cast. Let’s just say that it’s a really good thing that Cowboys & Aliens isn’t in 3D – the extra charge might have had unpleasant results. Previous PostSee The Vampire Diaries ‘Sizzle Reel’ that Debuted at Last Weekend’s Comic ConNext PostSpartacus: Vengeance – Bigger! Bloodier! Better? 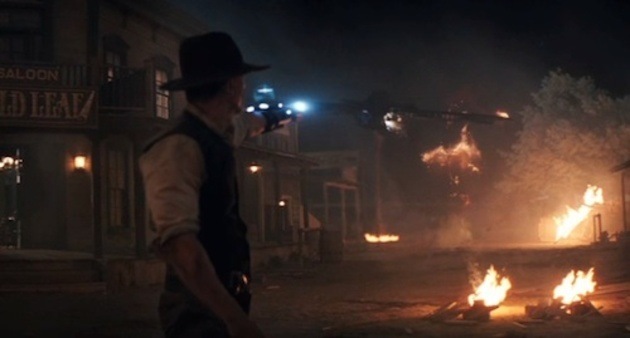 “Cowboys & Aliens” is a sci-fi cowboy adventure about a western town being terrorized by creatures from outer space. There is a lot of violence, death, special effects, and foreground music. Doesn’t really work.